Back in 1984, I committed my life unto the Lord after he saved me and changed my heart. In no way am I perfect, but I have been forgiven. I am so thankful that He loves me, and my sins are forever forgotten. To be a servant and each day a better wife. desiring to please God, whatever I do. Desiring to help others,for I really do care. To Him, I know to Him my life belongs. Paper, paper,paper, my cat loves paper. Any time she hears the sound of paper being scrunched, her ears perk up and she is in the attack mode. I make a paper ball, throw it, and she is off running and rolling. The cheapest toy ever. She carries it, bats it, and sits on it. That paper ball has become one of her best friends. 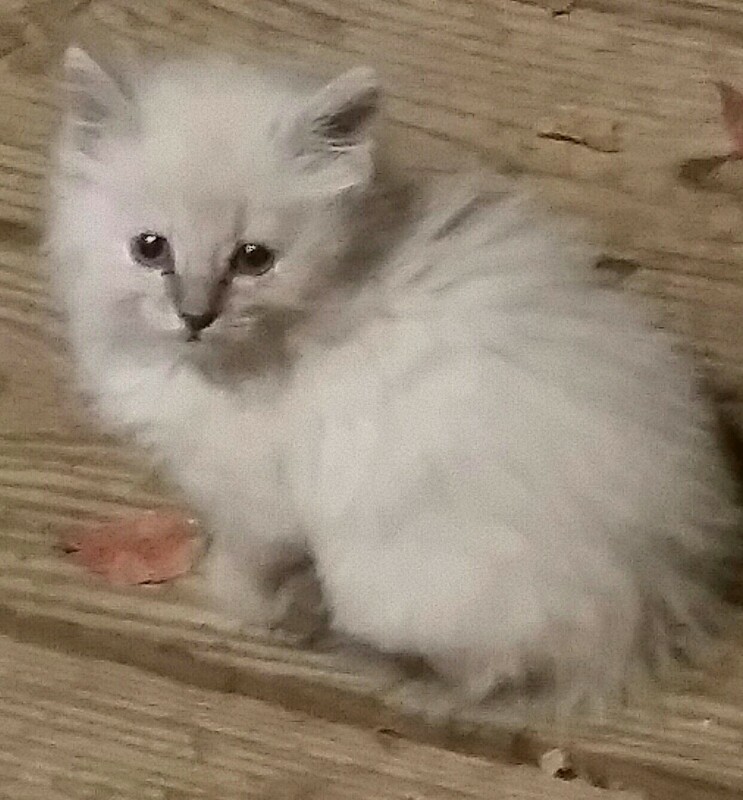 My daughter had found this beautiful white kitten on the side of the house lost and in need of a home. And of course she wanted to be the caretaker. My husband said, he felt the Lord sent it for her, so we adopted her and she is now our house cat, named Snow. So if your in need of a cheap toy for your cat, just make a paper ball and they will come running. Some days it’s really hard not to meddle,especially as a mom. I really have to pray for the good Lord to help me not to say anything when I (as in this flesh) really want to. I just go before the Lord in prayer for my children that he might speak to their hearts and give them wisdom to make the right decisions in their daily lives. I am so very blessed with a wonderful family, and do my best not to meddle even though I’m sure I fail at times,but am working on it. There are times on Sundays, when my husband is getting ready for church he will take a few minutes and give his shoes a good polish. Even if I think they look nice and shiny he is working on them to make them look even shinier. When I think of the definition of polish,which there are several, I think about my life for the Lord. How through his mercy he allows us every day to live for him. He works daily in our lives polishing us, smoothing out what is within us for His glory. We sing “This Little Light of Mine”, I’m going to let it shine, but we can’t shine without a good polish, good buff, and a good rub. Oh, that my life might shine as the Lord smooths out the rough spots, and gives me a good polish. Sharing how the Lord has blessed me! A Journey Through Blessings and Trials Blog at WordPress.com.